Part-Time Community Coordinators – World Adult Kickball Assoc. One of our top survey picks is Ipsos i-Say. (They’ve been around since 1975.) Earn points redeemable for rewards including cash and other great prizes. No car? Poor credit? You can still drive for Uber and earn up to $25/hr. or more. Here’s how. Get $5 cash for signing up and earn cash, not points, for surveys, at InboxDollars. Another RRR favorite. They’ve paid out over $43M to date. ♥ Share the love! 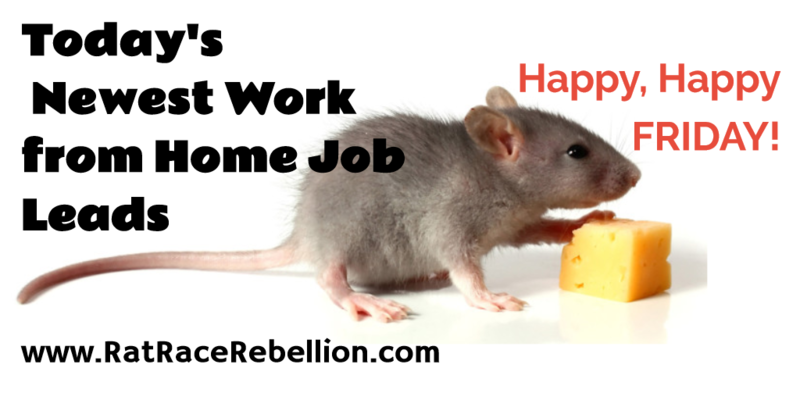 If you know someone looking for a work from home job or gig, please share this page. They’ll love you and we will too! Thanks! This entry was posted in Daily Job Leads, Work at Home Jobs. Bookmark the permalink.